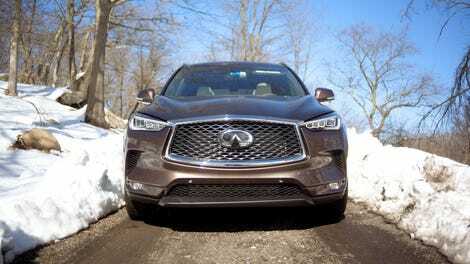 It looks like any other crossover, so you never know it from looking at it, but the 2019 Infiniti QX50 has a technological marvel at its heart. Beneath that handsome but not especially controversial sheet metal lies the company’s new variable compression ratio engine, a pretty fascinating piece of technology. But at the end of the day, even with the special engine, it just does a great job at being an everyday premium crossover that has to be all things to all people. It may even surprise you if you push it. 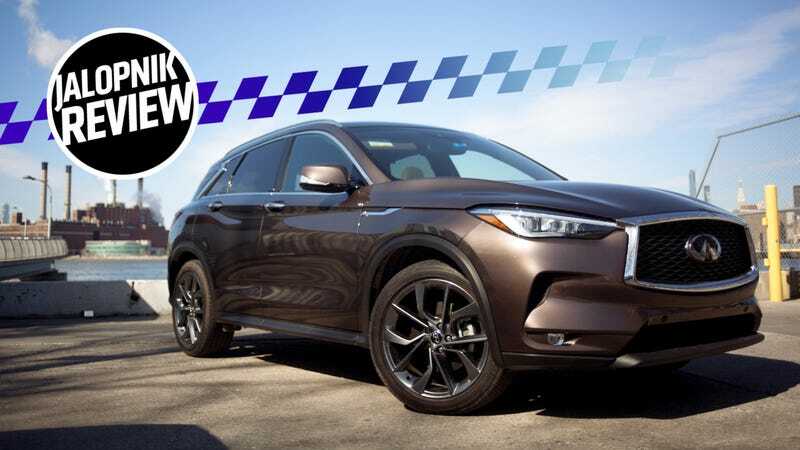 The Infiniti QX50 used to be the small Infiniti EX, but now it’s bigger and all-new for the 2019 model year. It’s now primed to seize some of that lucrative luxury midsize luxury crossover market share. Beyond that, there isn’t anything particularly exciting about it beyond how good it looks, inside and out—if you drive it like it’s meant to be driven. I did not drive it like it should be driven, which is in either Standard or ECO mode, shouting into a bluetooth device, and with a gym bag and real estate SOLD sign in the backseat. Instead, I fully explored all the QX50 has to offer—CVT transmission, all-wheel drive and 268 horsepower at 5,600 RPM and 280 lb-ft of torque at 4,400 rpm from that wacky new VC-Turbo engine. In layman’s terms the engine can change compression—the amount by which the piston squeezes the fuel-air mixture in the cylinder—on the fly, giving you diesel-like torque and fuel economy in a gasoline engine. If you were curious or nervous about the mechanically revolutionary variable compression engine, which can switch between ratios of 8:1 to 14:1, its triumph is in how normal it seems. The weekend I had the QX50, a bunch of my friends in their “performance cars” decided to go driving upstate, and since I had a car to drive for once, I figured I’d tag along. The QX50 has three driving settings. Standard has relatively laggy acceleration with a delayed jolt of torque if you throw your leg into it, the Sport setting is very responsive and fun, and the Eco mode hardens up the accelerator pedal and is appropriately miserable in its effectiveness at limiting fuel consumption. If you want to feel like your car is broken, keep it in Eco. It's super comfy, has plenty of torque and doesn't feel too big. It can handle it if you push it. In the city, the QX50 is easy enough to park, especially with the optional surround-view cameras, and it’s very comfortable in stop-and-go driving. It’s punchy enough for those dramatic tight space lane changes to make a light or get around a taxi, and relaxing enough to keep your blood from boiling from the frustrations of gridlock. The nav system’s maps didn’t know about bridge closures and I couldn’t figure out how to redirect my route. I may have yelled before just getting my phone out. After that, the only city driving I did was a mad dash to get some photos of it clean before it was scheduled to be picked up. The real experience was my Sunday afternoon drive with a WRX STI, a V10 BMW M5 and two NA Miatas on some lovely sweeping hilly lake roads in Upstate New York, and I actually had a blast attempting to keep up. I firmly believe you can have fun in anything, and the QX50 in its Sport setting comes close enough. You can’t say that about most crossovers. The torque is what really saves it, doing most of the work behind what feels like a decent enough punch of power. The new VC-Turbo engine doesn’t really deliver anything that feels different from what you’d get from a traditional turbocharged four-cylinder, but that seems to be the point. Infinti claims a zero to 60 MPH time of 6.2 seconds for the AWD model. I’d believe that. But not without some criticism. The engine note in Sport Mode “sounds like a chainsaw,” according to one passenger. The handling is sharp and responsive despite the electronic steering, but it doesn’t communicate very much feedback. Still, it’s nothing to make you lose any confidence. I never experienced any unmanageable understeer and I had no hesitation following the dusty handprinted rear bumper of the M5 as it flung itself around a corner up ahead. For a crossover, the body feels planted in the corners, no doubt thanks in part to the AWD system, and the body roll is more than manageable. To my surprise, I can’t recall noticing any safety systems getting in the way of spirited driving, but I don’t doubt they were still an active silent guardian. The QX50 never felt untidy, and a friend remarked that he was surprised by how confidently I was hooning it. Yet the CVT’s attempts at convincing you it is changing actual gears are futile and annoying. But the solid, comfortably located paddle shifters are good, even though no actual owner will likely ever use them. It was like having an impatient conversation with the car. I would brake, try to “downshift” and it would politely beep at me in protest until the needle was safely under 5,000 RPM again. My protest in response was just keeping it in “fourth gear” for the rest of the road, the chainsaw engine note yelling at me like a hungry house cat. Charging through some backroads in this feels alarmingly more like a video game than reality, likely due to Infiniti’s fly-by-wire Direct Adaptive Steering system, but it still makes for a fun video game. It was frustrating that the car couldn’t remember my driving settings (Sport mode with manual control) on startup, but the repetitive pushing of the buttons only added to the humorous and absurdly aggressive approach I was putting this mid-size four-cylinder premium crossover through. I was genuinely surprised by the QX50, and that’s where it’s better than it has any right to be. In a time when Audi and Lexus design seems garish and BMW feels just lost, the swoops and creases of the Infiniti lineup have surprisingly evolved into something interesting, flowing and dare I say elegant. The QX50 wears the look well. The Chestnut Bronze paint on our test vehicle paired with the deep shimmery grey wheels is a modern look that, unfortunately, didn’t show off how dirty I managed to get the QX50 very well. Critically, the QX50 is also available in a lovely shade of Hermosa Blue or Dynamic Sunstone Red which stand out from the mediocrity of the other black, grey and white options. The QX50's interior is also a fine place to relax. The one I lived with for three nights was dressed in layers of white and brown leather with blue suede accents and brushed aluminum trimmings. Most of the major surfaces are as nice to touch as they are to look at, but the assembly isn’t as solid as it should be. One of the more noticeable worries was how unstable the center console block was if an elbow or knee knocked it. The whole package is a little let down by some unfortunately cheap plastic pieces, but it’s not distracting. The punched white leather seats, surprisingly featured for the rear passengers as well in this top-level trim model, were very comfortable and suitably bolstered, and had the capability of both heating and cooling in three different levels up front. The heated steering wheel seemingly corresponded to the setting of the heated seats. The two-screen infotainment system features information and entertainment but not Apple CarPlay nor Android Auto, which is inexplicable and, frankly, bonkers on a new luxury car in 2018. The top screen is dedicated to a painfully bad navigation system with outdated maps, but it’s angled in a manner that, I discovered, can comfortably house the phone you will likely use to navigate instead. The steering wheel controls arealso fairly odd to adjust to. The buttons are tightly clustered and fairly small. I still have not trained myself not to use the radio controls in the center console in any vehicle. If you’re like me, the majority of radio control buttons on the infotainment system are refreshingly physical and easy to find. The active cruise control activation button bewildered me at first, as it shows a blue car with blue rings around it, which apparently is supposed to represent the lane-keeping assist and speed-following functionality. The system itself works like a charm when the lane markings are sharp and you keep your hands on the wheel. When not using the cruise control, the steering wheel constantly vibrates anytime you even think about changing lanes without signaling or moving anywhere near the lane lines. You understand that this is a nonstop occurrence in New York City driving. Hands began to go numb and I was desensitized from the intended influence of the safety feature after the first day. Luckily you can turn this off, and you will want to. The fancy new VC Turbo engine, which Infiniti has featured in a series of concept cars including the recent Q Inspiration Concept, is a success, if only because it operates with no negative impact on performance over a standard engine. The upside is that it achieves decent fuel efficiency when not driving like a maniac—Infiniti claims 26 mpg combined—but the downside is that it requires premium fuel. The lowest-trim QX50 Pure FWD starts at $36,550. The Essential AWD model I tested starts at $45,150. This specific QX50 also included the $550 ProASSIST Package, the $2,000 Autograph Package and the $7,500 Sensory Package, which includes the heat and audio packages. The total MSRP on this car was $57,200, which probably undercuts some of the German makes but still strikes me as high. Considering the amount of standard features you can get on the Luxe trim level and even keep AWD without going over $40,000 (on paper), I’d say you don’t need to aim higher than that price point. The only considerable feature you’d miss out on is the super fancy leather seats, but big deal. The 2019 QX50 is an attractive and smart mid-size crossover that’s just a nice place to be. It may not hold the same esteem or image of the other just as characterless luxury offerings in its segment, but it makes up for it with unquestionably good looks and a premium-enough feel that sets it just far enough away from what Infiniti is doing. It’s still unacceptable that there isn’t better compatibility with smartphones, or even a decent in-car system to supplement what I get from a phone. Infinti really needs to work on that. It’d also be nice to get rid of the cheaper piano black trimmings around the screens, and the cheap plastic housing around the transmission controls. They’re a big contrast to the rest of the materials used, and it definitely shouldn’t be an issue on the top level trim. It’s almost upsetting how anonymously Infinti has managed to package this motor, but that shows a degree of understanding and maturity in the QX50. It’s just here to look good, ride smooth and sell well, and that’s all we should ask of it. If you’re looking for fun, the QX50 is still a competent surprise. Remember, you can have fun in anything! But you’re going to buy this one for its comfortable interior, competitive pricing, standard features, and for what Infiniti is doing with its paint jobs, wheel options and sculpted body. Unless that new engine technology is unexpectedly unreliable, you won’t have any regrets.